Nowadays, many manufacturers seem to think all speakers should contain a virtual assistant. Yeah, having Siri, Cortana, Google, or Alexa can be convenient, but not everyone wants one of them integrated into their speakers. From a privacy perspective, these always-listening assistants can be a nightmare. Not to mention, these virtual "beings" can complicate something that should be very straightforward and relaxing -- listening to music. The largely panned (non-portable) $350 HomePod, for instance, doesn't currently support Bluetooth and only works with Apple Music. That's one of the reasons I was intrigued by the JBL Boombox -- no gosh darn integrated assistant or lock-in. As the name implies, it is a throwback to boomboxes of yesteryear, but it is on a much higher level. Rather than play cassettes, CD, or FM radio, it connects with Bluetooth so you can play tunes from your smartphone, tablet, or other device. Because it has a handle, you can walk down the street while blasting your favorite music or just easily transport it between locations. Be warned -- it is quite heavy. Handle aside, it is a vey good outdoor speaker for other reasons too. For one, it is IPX7 waterproof so if it falls into a pool, for instance, it won't die. You cannot say the same about older boomboxes from the 1980's or 90's -- water could easily destroy them! 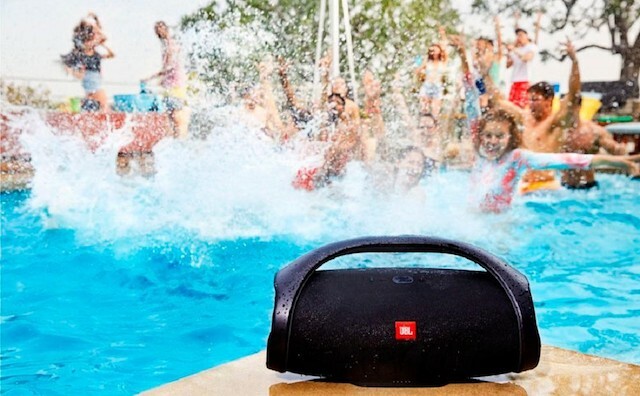 The JBL Boombox would be at home on the beach or a family barbecue too. It even has an outdoor listening mode than can be toggled by pressing a button on the rear. This will optimize the sound for when you are outside, while switching back to "Home" makes it sound better for indoor use. Ultimately, how it sounds is key. I am happy to report that it is exceptional. 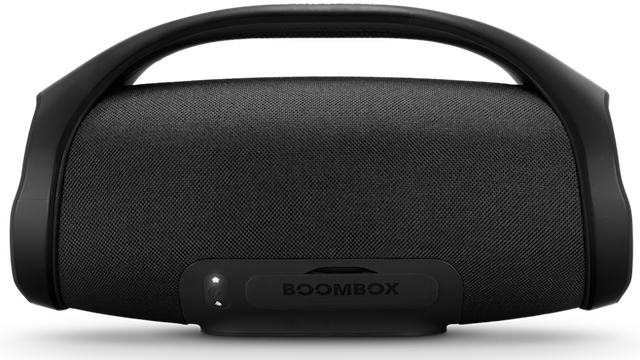 The Boombox utilizes two 4-inch woofers, and two 20mm tweeters. 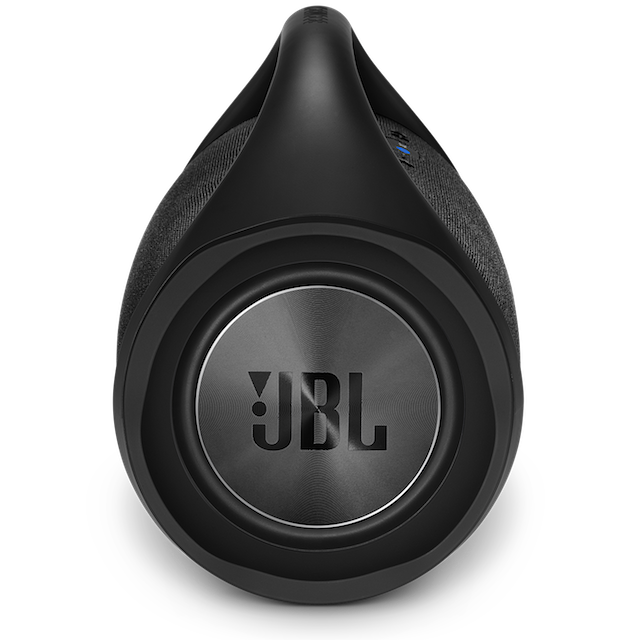 If you like bass -- which I do -- JBL's offering will not disappointment. Actually, for a Bluetooth speaker, this has the strongest bass I have ever experienced. If you listen to Hip-Hop -- my genre of choice -- you will be in heaven, as the prominent bass will make your favorite jams sound incredible. When listening to other genres of music that do not emphasize bass as much, however, I am happy to say it still sounded great. The audio remained clear and crisp, and the bass did not seem over-emphasized. Ms. Joni Mitchell and Lou Reed sounded great, while Weezer's first album sounded as wonderful as I remembered. My biggest complaint is the sound when no music is playing. When a song is over, and no audio is being passed to the JBL Boombox anywhere, there is an audible "hiss" or "static" that lasts just a few seconds. It is a minor annoyance, and not a deal-breaker, but still worth mentioning. I experienced this when using both Bluetooth and the 3.5mm audio jack. Yes, it does have a 3.5mm audio jack for devices that don't have Bluetooth, but let's be honest -- such devices are exceedingly rare. If you wanted to connect a portable CD play to the Boombox, however, you could -- I guess that's cool. I actually utilize this analog port when connecting to my desktop (using a 3.5mm to 3.5mm cable). I mean, if you are indoors, and you don't need a wireless connection, a hardwired connection can be preferable. With that said, I couldn't notice any significant difference in quality when comparing Bluetooth and analog input on JBL Boombox. The downside to using the 3.5mm audio jack outdoors, is that you will lose the waterproof feature. You see, that jack, plus the power port, are behind an airtight door. With that door open, water can get in and ruin the Boombox. Also in that compartment behind the airtight door? Two USB-A ports. Why? 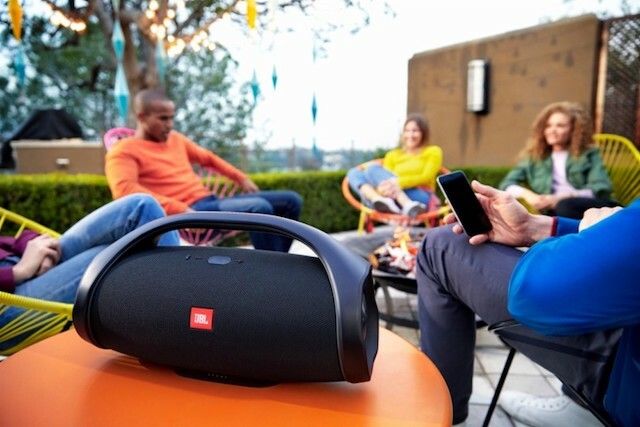 It is actually quite cool -- you can use the JBL Boombox to charge your devices. For instance, if your smartphone is low on juice, you can connect it to this speaker to top it off. It works great, thanks to the Boombox's monstrous 20,000mAh battery. 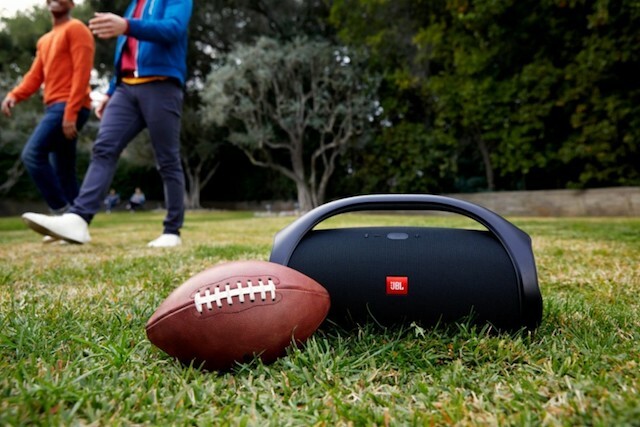 When playing music, JBL claims Boombox can last for 24 hours before needing a recharge. While this is probably possible with the volume very low, you will definitely not experience that when listening to music loudly. My experience has been about 15 hours, but I usually blast my music. Believe it or not, you can link several of these together for even more volume, but at $449 each, I cant imagine many consumers doing this. I was unable to test this feature, as I only have one. Even if you can afford several Boombox speakers, I doubt you will find the need -- one should be loud enough. 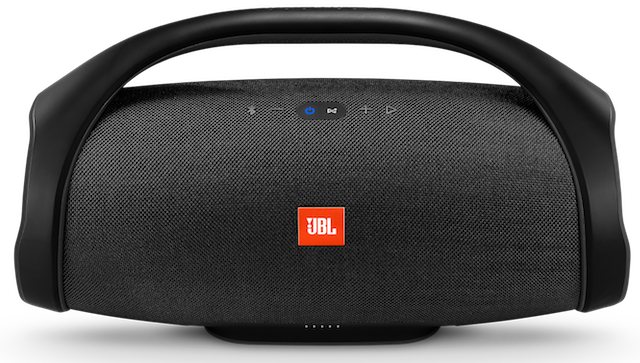 With that said, it isn't just other Boombox speakers that can be linked, but any JBL product with the proprietary "Connect+" technology. While the JBL Boombox does not have an integrated virtual assistant, you can use it to summon either Google or Siri when your smartphone is connected. Using the JBL Connect+ companion app, you can map the play button to either of the two aforementioned assistants. This is cool, as you have to press a button -- the JBL Boombox is never listening to you for a wake word. With that said, the JBL Boombox does have a microphone. Why? For speakerphone mode. If you want, you can answer calls using the Boombox -- the caller will be heard through the speakers, and the microphone will pick up your voice. Let's be honest though -- who the hell makes phone calls anymore? Text messaging is king these days. 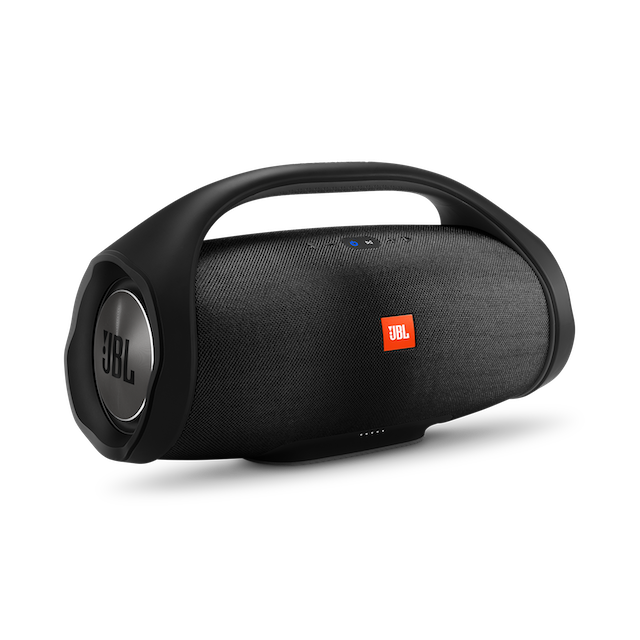 Do I recommend the JBL Boombox? Well, that depends. If you are searching for an indoor-only speaker, spending $450 for this beast just wouldn't make sense. Who should buy it then? A person with a need for a very loud outdoor speaker -- someone that hosts backyard parties, goes camping, or makes frequent trips to the beach. The ability to charge your devices with it is a total life-saver too, allowing your outdoor fun to last for many hours. Highly recommended.